A few new pics of the NVIDIA Kepler GK104 based GPU have been leaked online, The card pictured is said to be the GeForce GTX 680. 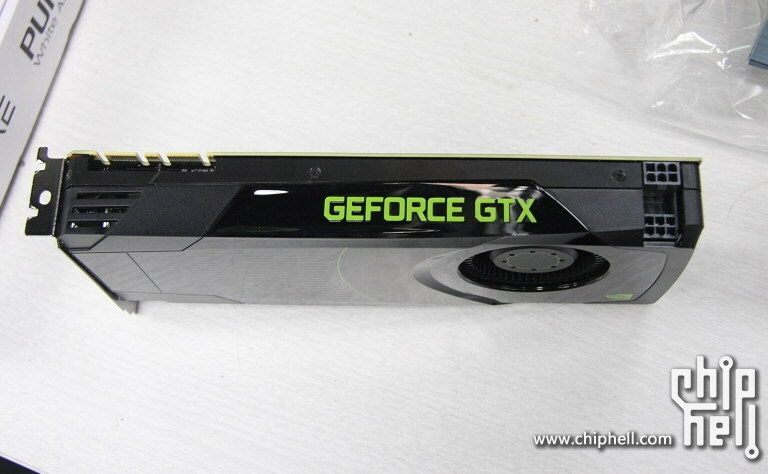 The card was previously known as the GeForce GTX 670Ti which Fudzilla later reported was an internal name used by NVIDIA. The pictures once again show the cooler shroud equipped with a large GeForce GTX Logo, a large blower fan used for cooling the vapor chamber and the stacked 6 Pin Connectors. The card is missing the name badge which was spotted right at the top of the rear panel in the previous shots. TDP is said to be around 200-225W. The card uses a black PCB color scheme and has 2 SLI connectors which allow for Quad Way GPU support. Display connectors include two DVI, one HDMI and a single Display port. Card is expected to launch on March 22nd-23rd with a suggested retail price of $549.